Our mission is to ensure historically significant films by Ken Burns and other filmmakers are completed, broadcast, promoted, and shared in ways that reach and inform as many people as possible through robust civic and educational outreach. 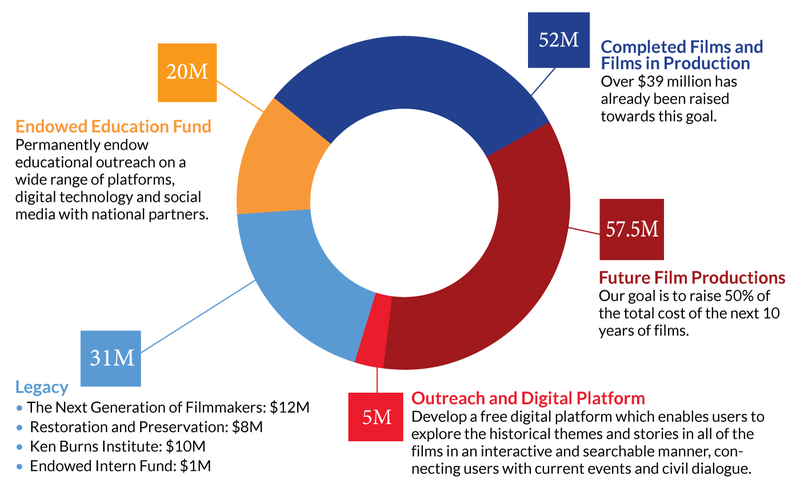 We do this through funding upcoming productions, planned out over the next ten years to include important documentary series on The American Revolution, Hemingway, Mohammed Ali, The Holocaust in the US and more. We see this as an important and impactful way to support American democracy and American cultural life. The documentary films in production explore topics ranging from the history of country music to the life of Muhammad Ali. Learn more about our team of Filmmakers. For the past twenty-five years, the Ken Burns’s name has symbolized a trusted resource for classroom use. The legacy initiative is also focused on the restoration and preservation of Ken’s work over the last thirty-five years. The Better Angels Society supports lifelong learning through events designed around each film. A key component of continuing Ken’s legacy is to engage and empower the next generation of documentary filmmakers.